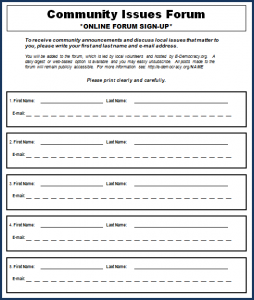 Local Recruitment Tools – Paper Sign-up and Poster Templates was written on January 19, 2010 and filed in All, Issues Forums, Local, Neighbor Neighbourhoods, New Efforts. Update: Note our directory of current print materials. Whether you are launching a new Issues Forum or want to refreshing your membership, we’ve found nothing more effective than in-person recruiting. Nothing. 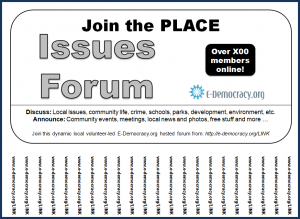 Because our forum are hyper-local, the only way to get to the 10% of households we now have in Cass Lake Leech Lake and the Minneapolis neighborhoods of Powderhorn and Standish Ericsson, is to sign people up on paper or stick posters up around town with a web address “tab” instead of a telephone number. Advice for Using the Templates – See the links at the bottom of our Inclusive Social Media page and other blog posts on new efforts and neighborhoods specifically. During our recent pledge drive, we promised that your donations would go in part to help grow our forums. So, if your community goes the extra distance and signs people up on paper, we will gladly pay Ed Davis, our trusty part-time participant support lead, to type up the results you Fax or scan in and send to us. Only the “home office” has the ability to upload members without the need for those sign-up to click through on a verification e-mail link. We’ve found that most people miss those requests, so be sure to ask our help with the upload rather than use the bulk invite feature available to Forum Managers or you’ll lose 80% of those signed up on paper. In Cedar Riverside, with a large East African population, as part of our new Inclusive Social Media push, we recruited 50 new participants in one night at the community Multicultural Dinner on paper. This membership leap to over 200 clearly meant something as the community exchanged views and grieved over the tragic triple homicide at a Somali-owned store in the neighboring Seward area. While Seward has a large East African population (in large rental complexes and mostly white homeowners to the south), that forum too would benefit from a similar in-person outreach and community posters because those diverse communities are not yet well represented on their local forum. People do not just show up. They don’t Google local community forums. Word of mouth and e-mail invites work best with those “who already show up.” We can do better than that. The recent Cedar Riverside experience demonstrates the value of our funded start-up efforts to bring out real diversity and the practical and reasonable limits of the all-volunteer effort in Seward and other communities. That said, if you have the volunteer time and interest, recruiting in-person and with posters around the community is something you can do now to make a real difference. Also, if you think a local community foundation or donor might support some funded aggressive outreach for your forum, we can help support those local efforts with training and support. Please publish as ISO OpenDocument Format instead of Microsoft Word. Microsoft is much less democratic.